After more than 5 years of living in temporary housing, the community of Tukuraki in the highlands of Fiji are today celebrating as they move into their newly built, disaster resilient village. The Tukuraki community was devastated in 2012 as a landslide buried 80% of their village and tragically took the lives of a young family including a toddler and young baby. The community were forced to relocate to temporary homes as they were at risk of further landslides and in the midst of recovering from the landslide, the community was hit by Cyclone Evan only 10 months later. Just recently the community was again forced to flee to nearby caves as Tropical Cyclone Winston hit in February last year, the community’s third major disaster in four years. As a result, the Fiji Government deemed relocation for the inland community an urgent priority and approached the Pacific Community (SPC) to support in this work. Today, 11 homes and a community hall built to category five cyclone standards was officially opened. 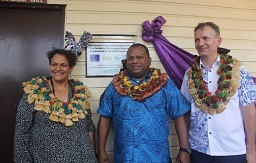 The $756,000 FJD relocation of the Tukuraki Village to a safer and less disaster prone site was made possible through the European Union and the ACP Group of States -funded Building Safety and Resilience in the Pacific Project (BSRP) implemented by the Pacific Community. The BSRP Project is committed at reducing the vulnerability for the Pacific to disaster and climate change. “Today as we celebrate the critical milestone for Tukuraki, we also remember Anare Taliga (38 years), Mereoni Robe (23 years), Losena Nai (18 months) and Makelesi Matalau (6 months), who lost their lives to the devastating landslide that altered the lives of everyone in the Tukuraki community. “The achievement of creating a disaster resilient community that has been led by the community itself is testament to the resilience of the Tukuraki community,” he said. In addition to the buildings, the project also provided the community with access to a reliable water sources. The Ba area is known for enduring long term droughts and to counter this issue, the project built a dam nearby and have strategically placed water tanks that connect to each household, ensuring the community will never run out of water. “This community knows and understands disaster but what makes this relocation remarkable is the partnership led by Fiji Government with SPC and the European Union to achieve real, measureable disaster resilience at the community level. We know this new community will protect not only the lives but the livelihoods of the Tukuraki community and we are immensely proud to be a key partner in this work,” Pacific Community Deputy-Director General Dr Audrey Aumua, said. Along with the eleven homes and the evacuation centre, the Tukuraki community have also been assisted with a retaining wall (to prevent soil erosion), road access, site levelling and a playground. The new location is closer to Nalotawa District School which means the community will have easier access to schools as well as health services. “We are proud to partner up with the Fiji government and the Pacific Community on this project as it not only has helped the people of this community, it has also established for the nation what a resilient rural community looks like. With the effects of climate change and rising tides threatening coastal communities all over the Pacific, Tukuraki stands as a great example of how effective partnerships can sustain development” the European Union head of Cooperation, Mr. Christoph Wagner said. Tukuraki is the first inland community to be relocated, a unique feature as the other 46 key priority communities for relocation are all coastal.